Ever since I started using the Silhouette CAMEO I've been getting more and more emails that ask similar questions. So, putting some of my answers in one place just seems logical and hopefully helpful to some of you. These are only tips for beginners and I cannot guarantee they will work for everyone. if you have bigger issues with your machines be sure to contact Silhouette. I've heard that they are quite responsive with questions. 1. 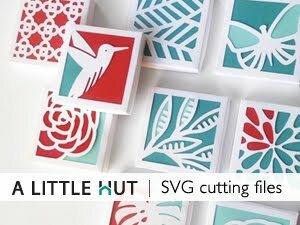 How do I import A Little Hut files into the Silhouette Studio library? Download all the files to your computer. Click on File>Import to my Library and import the files one at a time. You can name them anything you’d like in the pop-up window and add keywords if you prefer. Be organized from the start! Create folders such as “flowers”, “borders” etc. That way you can find the files easily next time you need them. 2. How do I create new folders? You can do this two different ways. Click on the folder image in the second row of icons in the top left hand corner of the software window. If you need a sub-folder, highlight the "parent" folder and then click on the folder image. A sub-folder will appear under the "parent" folder. Right click on the My Library folder and click on "New Folder" from the pop-up window. A new folder will be added to your list of folders. To create a sub-folder click on the "parent" folder you'd like to add a sub-folder to and right click on it. Click on new folder in the pop-up window. 3. How can I make my mat less sticky? Place a clean piece of fabric over the mat and pull it on and off a few times. Don't overdo it or you'll be asking the opposite question! 4. Are DXF files compatible with the Silhouette Studio software? Yes. SVGs can be imported directly to the Silhouette Studio Designer Edition for which there is an additional fee. They cannot be imported to the free version of Silhouette Studio. Do A Little Hut files work with the Silhouette Cameo? Yes! I include SVGs and DXF files in all my products. 5. How can I lift my paper without tearing it? Use a spatula. I have never worked without one. I don't own the Silhouette version (I still use my old Cricut spatula) but I assume it would work just as well. I don't see how anyone can work without this tool and why it isn't included with the machine. It's a must! This is a goofy one that I hate to admit to. It had me stumped for a few days when I was a newbie. - Check the Silhouette Cameo screen and make sure that you have the "Load Cutting Mat" highlighted if you intend to use the cutting mat. If you have "Load Media" and you're using the cutting mat instead of vinyl the image will cut right into the transparent part of your mat (where it shouldn't!). If you have any more we can certainly keep adding to the list! I don't consider myself an expert on the Silhouette Cameo at all—I'm still learning too. Please refer your more involved and/or technical questions to the machine manual or to the Silhouette support team. 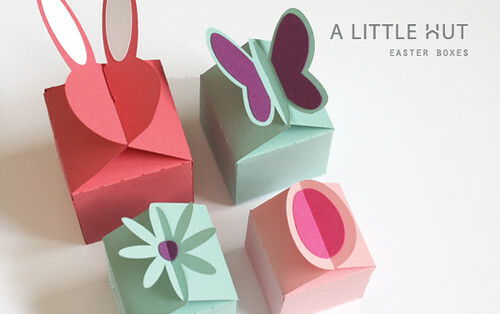 Photo - My Easter boxes are updated with additional pieces to give the images more detail. Starting Jan. 2013 I only sell my SVG Single Images in the Silhouette store. Everything else including my sets are sold in my A Little Hut shop.